An interesting bass from a legendary company. A company with an enviable history, Aria was a desirable brand throughout the Eighties, and models from that period are still avidly sought after - but for several decades, the company has struggled to repeat its earlier success. This particular model may not resemble Aria’s classic Super Bass range - but with a quilted maple top and caramel burst finish, it certainly has premium visuals. Just what do you get for your £1300? Added to its ash body and quilted maple top, the RSB-1500’s rounded body curves, elongated top horn and extensive cutaways make for a sizeable body, very similar to the Super Bass models of old. Minimal chamfering on the upper bout is compensated for by deep contouring to the rear of the body, while the lower cutaway permits full access to all 24 frets. The neck pocket is tight and the one-piece maple neck is securely attached using a six-bolt system. Regarding balance, there is some headstock bias - highlighted by the way the instrument hangs across the player’s body - but placed on a strap, the bass sits comfortably. The maple neck feels long, despite its standard 34” scale length; the body length and top horn contribute to this impression. Thankfully, the neck sports a slim D-shaped profile, while the broad maple fingerboard and 19mm string spacing make it comfortable and easy to navigate. The setup on our review model is professional, with no sharp fret edges, and the action and the 40mm nut width make the bass very playable. Chrome Gotoh hardware works well against the caramel burst finish while the volume, balance, bass and treble controls turn smoothly, as do the machine heads. A pair of Aria single-coil pickups and 9-volt active two-band EQ circuit complete the electronics package. Pan across each pickup and you’ll hear a useful spread of tones. As expected, the neck unit is far rounder than the bridge pickup, but at no point does the neck unit sound unclear; you’ll require very little bass boost if you choose to solo that pickup. Moving across to the bridge unit, a crisp, detailed honk is achievable with ease, but you may find it useful to add treble EQ in small amounts until you find the clarity you’re looking for. Surprisingly, the treble control is quite reserved and polite - we were expecting a more glassy response. With both pickups in operation and the balance control set in the middle, the bass bounces along nicely across the frequency range. The bass EQ is thunderous, so we would definitely advise caution when boosting those frequencies. 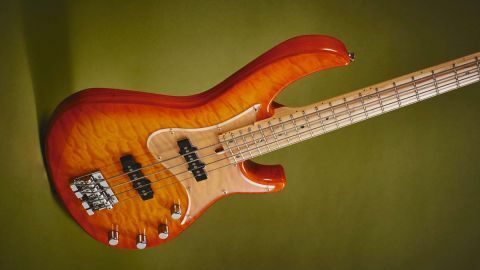 Pick players may find that the bass boost rounds out their tone, despite the initial string attack that a pick provides. The single-coils’ bright tonal performance works well with the darker tones provided by the ash body. Rock players, and anyone else looking for a full-bodied bass response, will certainly enjoy the tones that this bass has to offer. Fingerstyle players will find that it ticks many boxes for them too, but slappers and tappers may feel that it lacks a little definition in the upper register. Playability certainly isn’t in question here; the Aria’s body depth and broad fingerboard make playing comfortable and fretting intuitive. The strings feel tight under tension, but their tone is distinct and clear. This bass is solidly built and will no doubt prove a reliable stalwart for live gigging - just what you would expect of an Aria instrument. It isn’t lacking in the looks department either, but you might reasonably expect a little more for its pricetag. The components do a fine job and the bass has useable tones, but the sounds you can coax from it lack the stardust you might reasonably expect. Still, check one out; glitter isn’t everything.